Pair of alabaster 19th century seated sphinxes on pedestals bookends or statues. This is a simply stunning pair of the finest quality statues one could ask for. 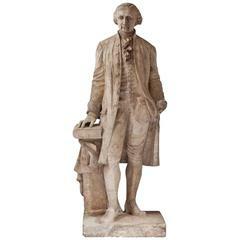 The late 19th or possibly early 20th century castings are of the finest quality and carvings. Each seated sphinx is pulling a cornucopia bodied behind their strong frames and both are perched upon rectangular based rose and vine carved pedestals. 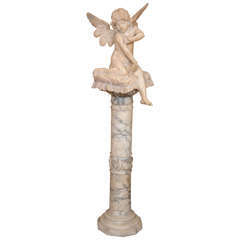 Each having been custom pinned into the pedestal base for stability. This fine pair were purchased from atop a mantle in a Greenwich Conn. Mansion. One with a very small, see detained close up, chip on the corner. We can easily repair this if necessary in our state of the art workshops. minor scratches and the like as one would expect from a piece of this age. One with a small chip to the corner of the base. 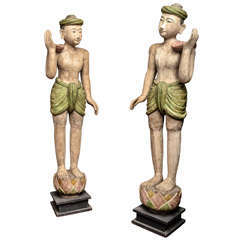 Fantastic pair of Thai figures on stands 19th century. Poly chrome painted. Each stands 70" tall. Very beautifully made and sculpted out of sandstone. With the pedestal included. 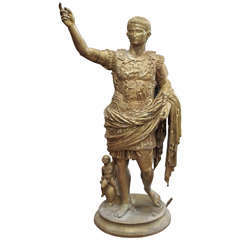 Beautifully Chased Bronze Figure of Caesar. 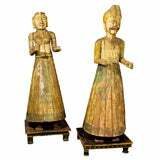 Pair of late 19th century Burmese lacquered temple statues used to support a gong between them face to face.